The Converter tool for converting, creating and customising your PDF files! Create PDF files from your Office applications on your PC – Word, Excel, PowerPoint, Visio, etc. 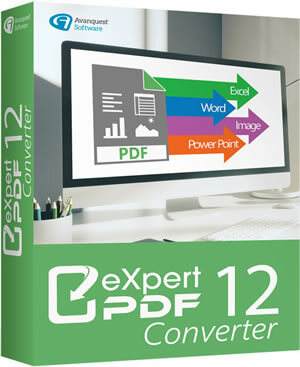 Expert PDF 12 Converter is the ideal solution to handle all aspects of PDF document management. This software can meet every single one of your PDF file requirements. You no longer need to find out whether the person you are sharing your file with has the appropriate application to view it. No matter what computer or platform you are using, the PDF file formatting remains exactly the same when the file is opened. The person you share the file with is sure to view the file exactly as you designed it. With the batch conversion feature, you will be able to convert a sizeable number of PDF documents in record time. You can then merge them into a single PDF file. The PDF format is the ideal format to send by email as it is smaller in size compared to, say, a Word or Excel file. What’s new in Expert PDF 12 Converter? The Expert PDF 12 Converter version allows you to open and view all PDF files and 3D ebooks in ePub format. You can now easily open two PDF files at the same time on the same screen using side-by-side display. PDF file conversion is accurate with no loss of information. All the elements (text, page set-up) can be retrieved and become modifiable. You can run the PDF creation function from any PC application that has a Print menu, such as Word, Excel, PowerPoint, Internet Explorer. Just right-click on the files to create the PDF. You no longer need to open the documents to convert them! One click is all you need to start converting documents for Word or Excel. You can also create PDF files from pictures in various formats (JPG, JPG 2000, GIF, TIF, PNG, EMF, BMP), manage hyperlinks and URLs, preview your document before converting it, send it automatically by email through Microsoft Outlook, or even save conversion profiles according to your habits and preferences: encryption level, password, picture compression, watermark, etc. Also, you can now easily add the document properties (author, title) for simpler, faster searching. The time you save with Expert PDF 12 Converter is considerable, and automation is central to all its functions. You will find that batch conversion is also particularly efficient, as you can merge several documents into a single PDF document.